Pig Island by Mo Hayder They say everyone has one good novel in them. Well perhaps Mo Hayder had two. Birdman, and in particular, The Treatment, were both excellent edge-of-the-seat noirish crime thrillers which brought a welcome new voice to the crowded, but rarely exceptional genre. With Toyko, it seemed Ms Hayder was intent on avoiding the pitfalls of many other authors : churning out endless novels based on overfamiliar detectives which are the equivalent of police soap operas : comfy but unchallenging. Tokyo was a departure, but kept one foot far enough in the thriller camp to satisfy the thrill-hungry among us, while offering a deeper literary experience at the same time. I had high hopes for Pig Island and was delighted to see her publishers finally getting behind Mo with some advertising muscle. I was titillated by the 'Wicker Man-esque' possibilities of the plot. Unfortunately, this book is an utter disappointment. The characters are generic and unengaging, the plot plods and none of the scarce, but potentially dramatic revelations are used to good effect. Only sheer stubborness drove me to finish the damn thing, and when I did, I was neither surprised by, nor cared about, the supposedly shocking ending. which felt as if it had been written to meet a deadline rather than any kind of literary criteria. 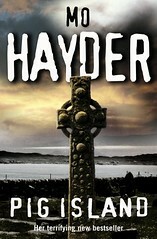 It's a crying shame that this will be the first, and most likely last, Mo Hayder novel that many people will read. I guess my disappoint comes from knowing how far the author has fallen : had Pig Island not had her name on the cover, I never would have guessed that this was the work of a writer I had previously been so delighted by. I've lent it to Tony who is half way through it and starting to share my disappointment. Pandora, I know you liked the others too so you can have it next if you want!